Public Security and Strategic Affairs Minister Gilad Erdan met with Italian Deputy Prime Minister and Interior Minister Matteo Salvini on Tuesday evening. Erdan discussed with the Italian minister the cooperation between the two countries in combating terrorism, internal security and the struggle against the Hezbollah terrorist organization and the BDS movement. 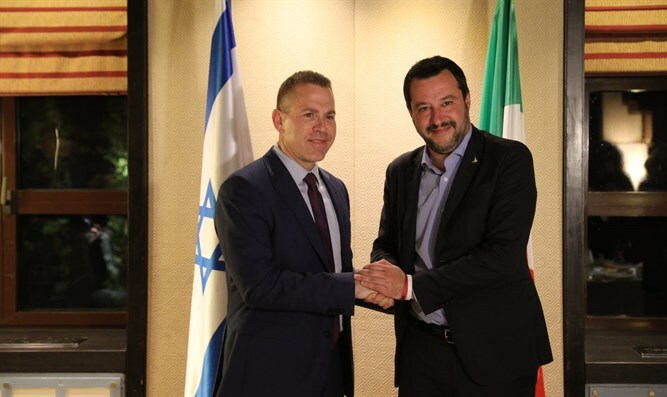 Minister Erdan referred to the northern arena and told Salvini, who arrived at the meeting immediately after touring the northern border, and that "in order to ensure the stability of Lebanon, it is essential to take firm measures against Hezbollah and Iran as soon as possible." He also noted that Hezbollah increased its arsenal from 10,000 missiles in 2006 to more than 150,000 missiles today and has dug terror tunnels, despite the presence of UNIFIL. Erdan said that Hezbollah uses infrastructure in Lebanon and that "in the war with Hezbollah, we will have no choice but to attack these infrastructures." Minister Erdan asked the Italian minister to influence UNIFIL, which is headed by an Italian officer, to be a pro-active force in implementing UN resolutions. "We are partners in the struggle against radical Islamic terrorism that threatens Europe and Israel, and Israel will be happy to share with Italy our knowledge and experience in the fight against terror and incitement," Erdan told his colleague. Italian Deputy Prime Minister and Minister of the Interior Salvini told Minister Erden that he is "proud to be here in Jerusalem, the capital of Israel, and to defend Israel and defend Israel. Israel is a fortress for the defense of Europe and the Middle East." Minister Erdan expressed his appreciation for "everything that Italy does to preserve the memory of the Holocaust, especially through an educational system," noting that it is vital to act against any form of anti-Semitism. "It must be recognized that a large part of the anti-Semitism and anti-Israelism in Europe comes from the new Muslim communities throughout the continent, and we must combat this phenomenon," Erdan told Salvini. After the meeting, Erdan responded in a tweet at the criticism of the meeting between him and the Italian minister, who is identified with the extreme right in his country. "Those who claim that there is no need to meet with such a senior and influential leader, like the Italian deputy prime minister and interior minister, should also demand that they boycott meetings with the inciter Abu Mazen, oppose the European contacts with the evil empire of Iran and demand that the terrorist supporter Zaatara not play any role. It's because political hypocrisy is all on the left," he wrote.